Welcome Sweet Warriors of the Heart, Vision Holders of the World that our Hearts know is possible. We know in our Hearts that a kinder way is possible. And how do we know this? Why is it so clear? What is this knowing and where does it come from? It is because we are Nature. We are built of Earth and there is a Wisdom that flows through all Nature. You can see it in the Forest. In the diverse abundance. You can see it running in the stream and singing in the bird song. And it is running in the streams of our veins and it is singing in the song of our Hearts. And that is why we know. The incredible Wisdom that has created this world knows exactly what it’s doing as it flows through us and our evolution. Every single cell of you is suffused by this Wisdom, this Life. And here we are, blessed to share another day for the Wisdom of these bodies to be able to hear and interpret. To see and to choose, to breath. There is a dynamic tension within us. It is of the grief and the pain that we feel of the state of the World combined with this knowing in our Hearts. These two forces are like the sun and the rain inspiring a seed to grow. At first, the seed is quite comfortable with the shell around it. Enclosing it safely, securely. But then the warmth and the moisture provide the irresistible urge to grow. This is like the tension in us. The pain for the world and then knowing that there’s another way. Realizing now that the other way isn’t relying on technological solutions or government agreements or anybody else to do anything differently. 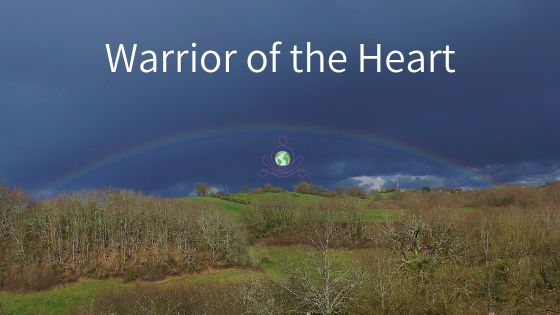 This is why I say Warrior of the Heart, because this is the work that begins inside each one of us and every one of us. As we look or imagine this kinder world, the world our Hearts know is possible. It’s a place where many things that are happening now are no longer happening. And a whole bunch of other stuff is happening. And yet when we look in this way, we are pushing against what is. And when we push against what is, our pain turns to blame. And unlike the Forest, we no longer move with an acceptance. Thank you for this day. For this breath, for all that has happened today. Thank you for all the people in my Life. And thank you for this Earth that supports me. Thank you for this air that fills me. Thank you for these birds that sing, the sun that shines. Thank you for the moss, and the dew, and the spiders, and the woodpeckers. Thank you for the technology that means I can record this, send it to you. Thank you for thank you. Thank you for the doorway that thank you is, the time warp of thank you. We’re deeply into the doorway of thank you. And it lifts my Heart so much that I find that right now, I am living in a world that my Heart knows is possible.